Easdale (Scottish Gaelic: Eilean Èisdeal) is one of the Slate Islands, in the Firth of Lorn, Scotland. Once the centre of the Scottish slate industry, there has been some recent island regeneration. A ferry sails from Easdale to Ellenabeich (Gaelic: Eilean nam Beathach) on the nearby island of Seil (Gaelic: Saoil), which is separated from Easdale by only a narrow channel. Confusingly, Ellenabeich is sometimes known as Easdale as a result of its traditional connections with the island. In 1549, Donald Monro, "Dean of the Isles" wrote, in brief reference to Easdale, of an island "namit in the Erische Leid Ellan Eisdcalfe" However the derivation of "Eisdcalfe" and this word's etymological relationship to "Easdale" is not clear. Haswell Smith (2004) notes that eas is Gaelic for "waterfall" and dal is Norse for "valley". Nonetheless, it is not clear why either description should apply to the island which is low lying and has no waterfalls. The Gaelic name, Èisdeal ([ˈeːʃtʲəl̪ˠ]) or Eilean Èisdeal has a long vowel and local folk legend attributes this to a derivation from èist thall "listen to that yonder". 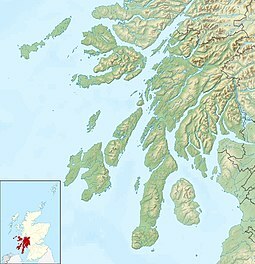 Gaelic Place-Names of Scotland states that the first element is obscure, the second Norse dalr. It is not clear if this Èisdeal shares its derivation with Gleann Èisdeal (Glen Ashdale) (Glen of Ash trees) on the Isle of Arran. Ellenbeich is usually analysed as Eilean nam Beathach ([ˈelan əm ˈpɛhəx]) "island of the animals" but this may be a reflex of an earlier and homophonous form Eilean nam Beitheach "island of the birch trees". Once a centre of the British slate industry, Easdale had a community of more than 500 working as many as seven quarries, some of which extended to 300 feet (91 m) below sea level. Easdale slate helped to build major cities of the British Empire and can still be seen on rooftops as far afield as Melbourne, Nova Scotia, Dunedin and Dublin. The great storm of 1850 flooded most of the quarries. Lacking any means of pumping the water away, the slate industry on the island more or less came to an abrupt end. The last slate was cut in the 1950s and the once active quarries are little more than still pools which provide a safe haven for a wide variety of flora and bird life. Nearby the former island Eilean-a-beithich once stood in the Easdale Sound between Easdale and Seil; however, it was quarried to a depth of 75m (nearly 250ft) below sea level leaving only the outer rim of the island. This was eventually swept away by the sea and little visible sign of the island now remains. By the early 1960s, the population had dwindled to only four people and the island appeared doomed. Descendants of the original quarrymen, along with others from around the world, have moved to Easdale to create a model of island regeneration. The island now has a population of around sixty people and is the smallest permanently inhabited island of the Inner Hebrides. British indie rock band Florence and the Machine filmed their double-feature music video for their singles "Queen of Peace" and "Long & Lost" on the island, with the videos using the villagers as the cast. The island is owned by Jonathan Feigenbaum, who succeeded his late father Clive Feigenbaum (the former chairman of Stanley Gibbons). Clive created local issues of stamps, and Jonathan has continued doing this. The island is home to a folk museum owned and operated by the Eilean Eisdeal, a development trust, as well as a bar/restaurant called "The Puffer". Eilean Eisdeal spearheaded the renovation of the Easdale Island Community Hall, which provides a venue for a wide variety of events. According to Mike Scott of the Waterboys: "The Hall itself is magical. From the first sighting of its pyramid roof and arced frontispiece across the water to stepping off its stage at the end of the concert, it cast a spell on us." In 2005 the local authority, Argyll and Bute Council, discussed plans to build a bridge between the island and Seil, linking the island to the mainland by road, despite there being no roads on Easdale. A company who operate high speed boat trips to view wild life and other local places of interest in the area have their base on Easdale. The World Stone Skimming Championship has taken place annually in September on Easdale since 1997. In 2012 the event came under threat after Jonathan Feigenbaum requested £1,000 for using the slate quarry the championship uses. The competition only went ahead after the Press and Journal newspaper offered to pay the fee. A community buyout of the island by residents is now under consideration. Mike Russell, MSP for Argyll and Bute said: "Not every community will achieve it and not every community should achieve it. But it is a live issue and becomes even more live in circumstances such as these." ^ Ordnance Survey: Landranger map sheet 55 Lochgilphead & Loch Awe (Map). Ordnance Survey. 2011. ISBN 9780319231227. ^ Monro (1549) "Eisdcalfe" No. 36. Translation from Scots: "named in the Gaelic language Eilean Eisdcalfe". ^ "How Easdale got its name". Tobar an Dualchais. Retrieved 26 May 2011. ^ "Easdale". Gaelic Place-Names of Scotland. Retrieved 26 May 2011. ^ a b Mac an Tàilleir, Iain (2003) Ainmean-àite/Placenames. (pdf) Pàrlamaid na h-Alba. Retrieved 26 August 2012. ^ a b "Slate Islands - The Islands that Roofed the World" southernhebrides.com. Retrieved 21 October 2015. ^ "Community website". The Easdale Island Trust. Retrieved 28 July 2007. ^ This is true only if bridged and tidal islands are excluded. Eilean Bàn, which is part of the Skye Bridge and Eilean Donan, which is tidal, were both inhabited at the time of the 2001 Census and smaller. ^ "Modern British Local Posts CD Catalogue, 2009 Edition". Phillips. 2003. Archived from the original on 5 September 2008. Retrieved 8 December 2008. ^ "Eilean Eisdeal" easdale.org. Retrieved 14 May 2011. ^ "The Puffer Bar and Tearoom" pufferbar.com. Retrieved 14 May 2011. ^ "Eilean Eisdeal". Development Trusts Association Scotland. Retrieved 22 May 2011. ^ "About Easdale: Easdale Island Community Hall" Archived 16 May 2011 at the Wayback Machine. easdale.org. Retrieved 14 May 2011. ^ "Home page: Stay Informed!..." easdaleislandhall.org. Retrieved 14 May 2011. ^ Paul Kelbie (23 May 2005). "Storm brews over island idyll as council plans to build bridge". The Independent. Archived from the original on 1 October 2007. Retrieved 28 July 2007. ^ "Welcome to Seafari" Seafari. Retrieved 18 November 2009. ^ "World Stone Skimming Championship". Retrieved 28 July 2007. ^ "Easdale World Stone Skimming Championships saved by £1,000 donation". (20 September 2012). BBC News. Retrieved 25 September 2012. ^ McKenzie, Steven "What motivates communities to buy land they live on?". (20 September 2012). BBC News. Retrieved 25 September 2012. Gillies, Patrick Hunter (1909) Netherlorn, Argyllshire, and its neighbourhood. Virtue. Monro, Sir Donald (1549) Description of the Western Isles of Scotland. William Auld. Edinburgh - 1774 edition. Wikimedia Commons has media related to Easdale. This page was last edited on 2 February 2019, at 20:33 (UTC).